Throw-in at O’Moore Park is 5pm on Saturday evening. CORK FOOTBALL MANAGER Ronan McCarthy has named a starting team showing five changes from the Munster final to face Tyrone in their All-Ireland SFC qualifier on Saturday. Last month, Kerry stormed to the provincial crown with a 3-18 to 2-4 win over the Rebels at Páirc Uí Chaoimh. Tyrone meanwhile, secured their spot in the Round 4 clash — a repeat of the 2009 All-Ireland semi-final which saw Cork triumph — after beating Cavan at the weekend. Mallow’s James Loughrey and Ballincollig’s Cian Kiely are the two new additions to the Cork defence, with Kiely making his senior championship debut. Brian O’Driscoll comes into midfield alongside Ian Maguire, while Castlehaven duo Brian Hurley and Michael Hurley start in the full-forward line. Sam Ryan, Tomas Clancy, Aidan Walsh, Kevin O’Driscoll and John O’Rourke all make way. Email “Five changes to Cork's Munster final team as they gear up for Tyrone qualifier”. 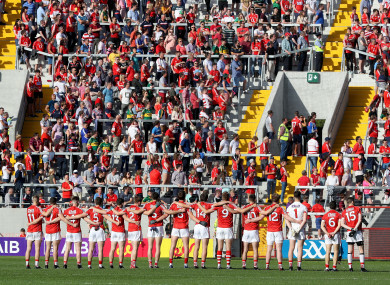 Feedback on “Five changes to Cork's Munster final team as they gear up for Tyrone qualifier”.